Board-certified family physician, Yetunde Sokunbi, MD, views her work as a calling. The oldest child of Nigerian immigrant physicians, she learned from a young age the importance of caring for others, working hard and giving back to the community in meaningful ways. A graduate of Rice University and Baylor College of Medicine, she completed her residency at the Halifax Family Medicine Program in Daytona Beach, Fla. She currently practices at the Austin Diagnostic Clinic and sees patients of all ages. Outside of work she is deeply committed to her community and profession. 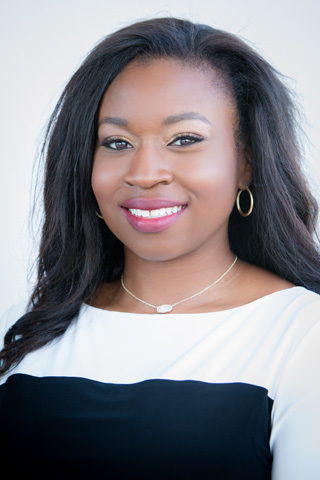 She serves as a clinical assistant professor for Dell Medical School and is a member of TAFP, the American Academy of Family Physicians, Texas Medical Association, Travis County Medical Association and the American Medical Association. She also volunteers with the Junior League, Young Women’s Alliance, Ronald McDonald Charities and Austin Young Chamber. How is active practice different than you thought it would be in medical school or residency? Full-time outpatient medicine is a bit different than what I thought it would be as a resident. In residency you are taught how to run a practice and the economics of health care, but you learn so much more as an attending when you’re based in clinic full time. In primary care, time management is essential. There’s so much to manage from seeing patients efficiently, managing administrative work and keeping up with CME. It’s important to work with a great team who can help with essential clinical tasks. I’m grateful to have great support staff! What is your favorite part about practicing family medicine? I absolutely love what I do. I am honored to be a part of my patients’ lives, helping them to get healthy and stay well. I love working with my fellow providers and with staff. It truly makes work fun when you’re surrounded by positive people. The day goes by so much easier! Who inspired you to become a physician? My parents are Nigerian immigrants, both of whom are physicians in East Texas. They worked very hard to get to where they are and are very successful. They taught me and my siblings that education is the key to success and to work hard every day to reach your goals. They also taught me the joys of being a physician. How does volunteering enhance the practice of medicine for you and what do you as a physician bring to these organizations? Through my various community organizations, I am able to connect with other like-minded young professionals across so many industries. We all have the same goal — making our community a better place. I get to meet so many people and help important causes. I’m also able to know what community resources are available should my patients have a particular social need. How do you envision your career evolving over the years? I see myself practicing full-time outpatient family medicine: Building a robust patient panel, seeing families, helping people grow and stay well — that’s what primary care is all about. I also envision myself getting more involved with various nonprofits and making change at a local, state and national level. What advice would you have for your colleagues and the future generation of family physicians? I believe that it’s important for everyone to practice self-care. Do what you enjoy. I love reading, running and singing in my free time. It’s so important to have creative outlets.